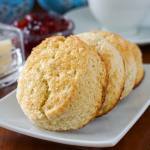 Sweet Biscuits - for teatime or for Strawberry Shortcake! Sweet Biscuits. Make them for a teatime treat or as the start of a simple but special shortcake dessert. Sweet biscuits are something that I have made for a long time in slightly different variations on the recipe. After the last few years though, I thought I’d share the version of the recipe that has now become my standard. These are very close to scones but a bit sweeter, especially if you go for the turbinado sugar top like I love to do. Turbinado sugar is available at most bulk stores, like Bulk Barn here in Canada. 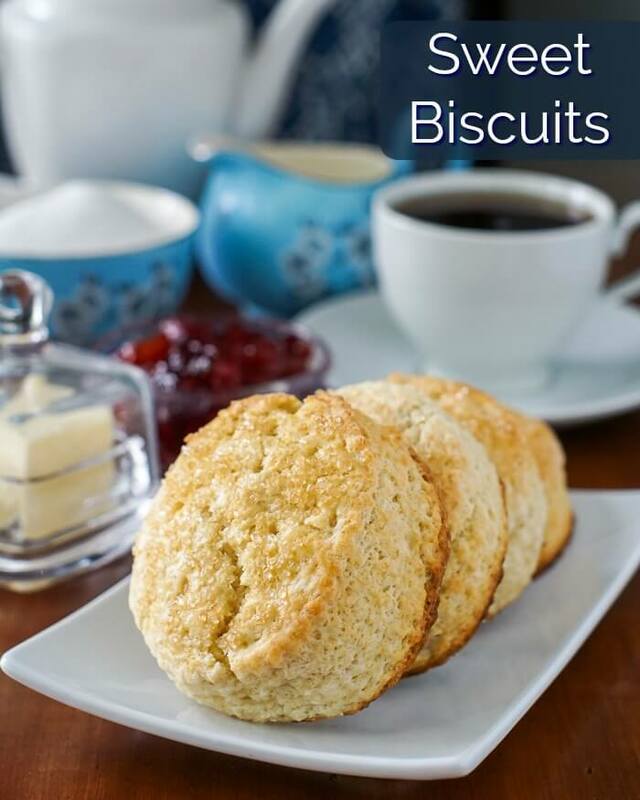 It is large coarse-grained raw cane sugar that adds a little sweet crunch to the tops of the biscuits. That step is, of course, optional in this recipe. They are a balance between being a little crispy at the edges when freshly baked with a soft, tender interior. Scones tend to be softer all around but in this instance I like the textural difference in the edges here. They are just a thing of amazing, simple perfection when served at brunch, warm from the oven, with melting butter. Summer is a great time to serve them, especially with seasonal jams like two of my favourites, Roasted Strawberry Jam or Roasted Peach Jam. The most common use for these sweet biscuits at our house has always been as the base for summer shortcake desserts, especially Strawberry Shortcake. We use whatever fresh fruit or berries are in season to make these delicious, easy desserts; peaches, nectaries, plums, cherries, blackberries, raspberries…whatever you like. We simply macerate the fruit in a little sugar for an hour or so and serve it between a split sweet biscuit with vanilla whipped cream. It’s the perfect summer barbecue or picnic dessert. 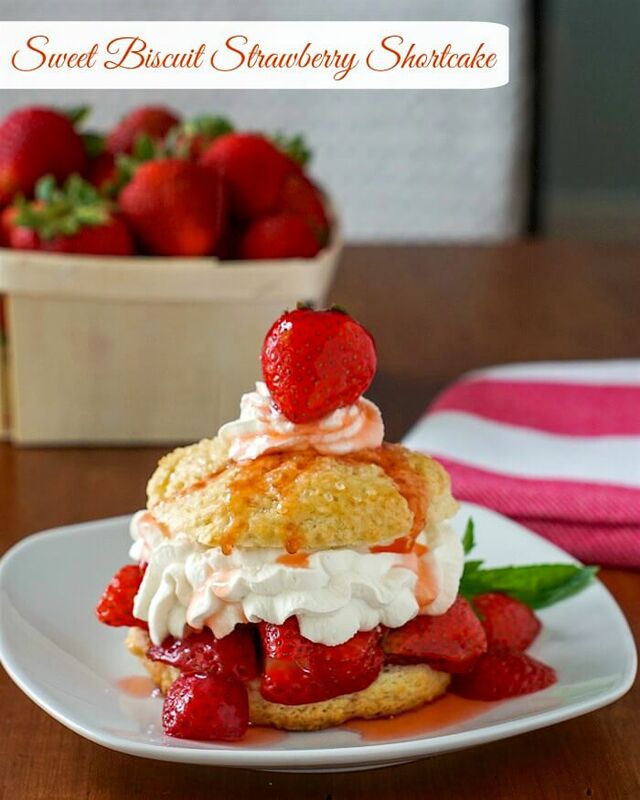 Find out how we make our Sweet Biscuit Strawberry Shortcake here. Like this Sweet Biscuits recipe? Sweet Biscuits - make them for a teatime treat or as the start of a simple but special shortcake dessert. 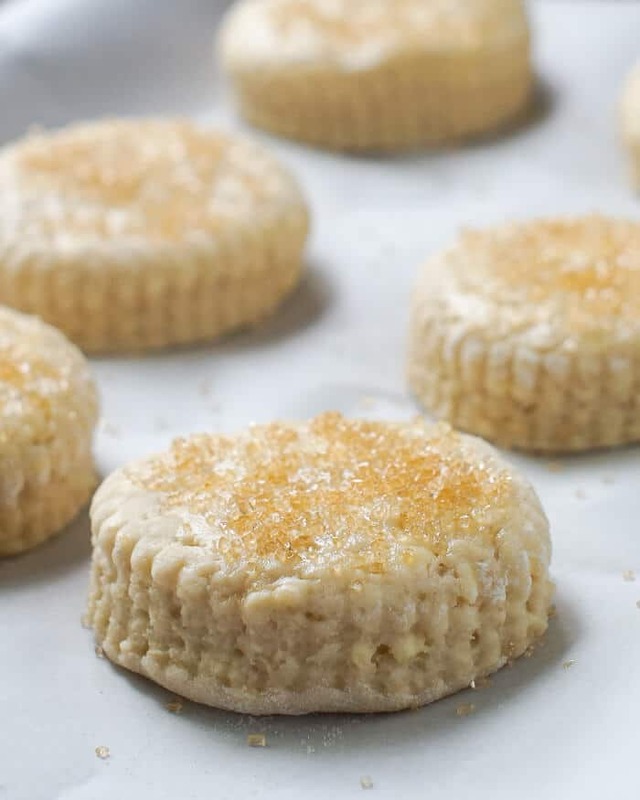 I start these in my food processor because it is so fast but they can be made just as easily in a large bowl by cutting the butter in with a pastry blender or just rubbing it into the dry ingredients using your hands. Cut in the butter until mixture resembles a coarse meal. Transfer to a large bowl and make a well in the center of the dry mix. Mix together the lemon juice, vanilla, milk and 1 egg. Pour into the well and mix only enough to form a dough ball. Roll to 1 inch thickness and cut out biscuits with 3 inch biscuit cutter and place on parchment lined baking sheet. Whisk together the egg and water to make an egg wash and lightly brush the tops of the biscuits with it. You will only use a small amount of the egg wash.
Sprinkle turbinado sugar on top of the biscuits. Bake at 375 degrees F for 20 minutes or until golden brown. Previous Post: « Strawberry Pie – Southern style with no added artificial colours or flavours. What if you are planning to bake these in a few hours? Would you suggest storing precut in a ball or cut and covered on the tray? I’d cut them and cover them and hold in the fridge. I just made these. I am a very experienced baker. I am not sure what I did wrong, but mine sure did spread. I am thinking it is because I only had 1% milk. It doesn’t matter though. They tasted delicious; light, fluffy, sweet, wonderful. They are good with or without jelly. I will definitely make these again.